YEY !! PULSE !! 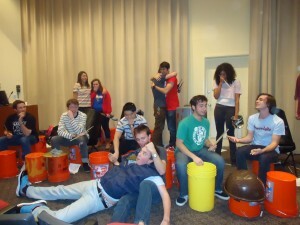 Skidmore’s only “Found Object Percussion Group“- They bang on stuff and it sounds so good !! My housemate, Cheyenne’12 is a part of Pulse and according to her they do not have a set schedule. From what I know Pulse is in high demand and often get asked to play for events last minute so they play for SGA organized events, for other programs on campus, and for their own shows. They are expected to have their annual Spring semester concert on April (oh its April now ! ) the 20th or the 21st. Check out some of their stuff. Found a few videos from ’07, ’09, ’10, and ’11. Enjoy ! This entry was posted in Events, Students and tagged clubs, fun, music, percussion, pulse, sound, stuff on April 1, 2012 by Altagracia Montilla. You Asked: What is the atmosphere for LGBTQ students on campus? Are there many people who identify as such? This campus is so unbelievably welcoming and accepting it should not come as a surprise that I would respond to this question by saying the atmosphere for LGBT students is one of comfort. I mean, could you really expect much else from a campus which offeres gender- neutral bathrooms in the academic buildings and a gender- neutral floor in one of the dormitories? I would say most of the students apart of the LGBT community openly identify as so. The Skidmore Pride Alliance is a SGA club on campus dedicated to building awareness of LGBT related issues. Amongst many things, SPA holds weekly meetings, organizes events- two of which are amongst the biggest parties of the school year- open to everyone, it sure does feel like everyone attends, and offeres ally training. This entry was posted in Clubs&Organizations, Formspring, Students and tagged accepting, ally training, atmosphere, attitude, clubs, community, free love, gender- neutral, LGBT, open, open minded, vibe on February 19, 2012 by Altagracia Montilla. Pulse, for the love of banging on stuff. Cool huh? Well Skidmore has it’s very own banging on stuff that “once was loved then was garbage and now is an instrument” group, PULSE. It’s pretty cool. No, its really cool. Watching their shows are just so much fun; it’s just about impossible to stay still. You have to do that like “uh this is a great beat” head bob thing or burst out into dance. Many of the students are already musicians and are in band/s but others have never touched an instrument in their life and just enjoy making a crap ton of noise, I can sympathize with that. Funny story, I actually tried out for Pulse as an eety weety lil’ freshman during the period of my life when I wanted to join just about everything I could fit into my schedule. But, yea, I auditioned and didn’t make it. Sad, I know, now I know what those American Idol contestants feel like (“wait, whahh? whatya mean I’m not good enough?! My mom told me I have the voice of an angel”). 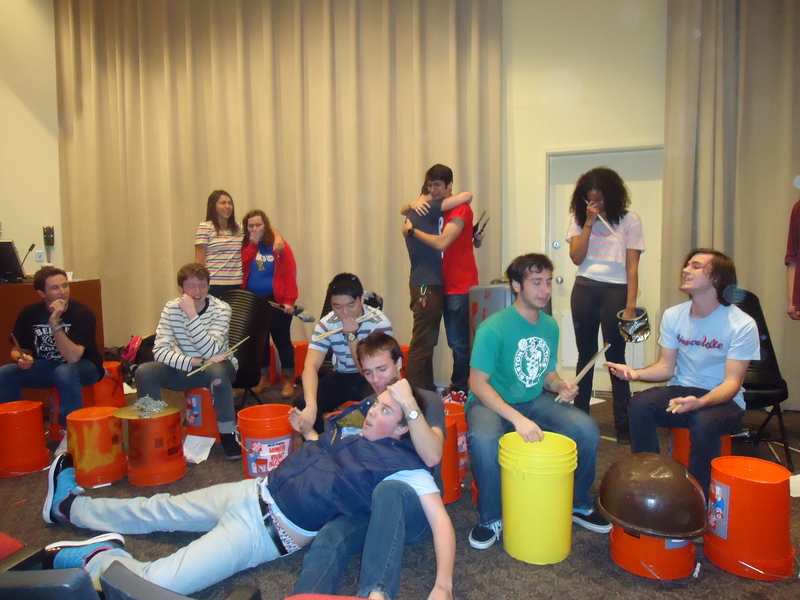 I learned later that the executive board committee then pretty much recruited anyone who auditioned that wasn’t afraid to kind of just get in there and play (during one of the audition stages we got in a circle and people were expected to get in the middle and pick an object to play). Like I said I was an eety weety lil’ freshman so I never “just got in there”. I was too shy 🙁 womp womp. But no worries because now I am not longer a shy froshy I am a bold senior ! and about the need to fulfill my obsession with banging on things and making noise, I just decided to bang on my dorm furniture and drive my roommate nuts. No, just kidding….maybe. Check out Pulse performing below. Skidomedy teamed up with Pulse for a pre performance skit. This entry was posted in Clubs&Organizations, Events, Videos and tagged bang on stuff, clubs, drums, fun, let's get loud, music, noise, organizations, percussion, performance, pulse, stuff on December 11, 2011 by Altagracia Montilla. A great question from a NYC Zinch’er. Thank you! I’m not sure if I will transition smoothly from the city that never sleeps to a smaller town with less commotion. I always find a place to go on a leisure day; like the movies, bowling, ice skating, ect. Do you think activities like these are as easy to find up in Saratoga? Or maybe in Skidmore itself; do you find students to be pretty occupied between work clubs and outside activities? I promise you there is so much to do. I know this is a big concern for many students who are coming from densely populated areas. There is heaps and heaps to do at Skidmroe- something every night. Evidence to this is that we have never been described as a suit case campus meaning none of our students go away for the weekend because Skidmore does not give you a reason too. Saratoga has heaps going on as well. Especially during the summer so everyone should stay for at least one summer. I think the difference between here and the city is that in the city it feels as if everything is just there, it comes to you, and you are familiar with it. Whereas here, it is helpful to be on top of everything. Read posters, check out websites, step out of your comfort zone and do not hesitate to meet new people from all walks of life. Another thing is that I feel like many NYC students expect all fun to involve dance parties. You will especially have a fantastic time if you step out of that mentality and realize a good time can be more than dancing and also include watching a show, listening to a lecture, participating in a particular club, watching a band play, etc. And when I say be on top of things I do not mean that events are hard to find I am just saying the information is out there, pretty in your face, so it helps to keep an open eye. And do not get me wrong about parties, those do exist here as well. This entry was posted in Clubs&Organizations, Events, Living on Campus, Off Campus Fun, Zinch and tagged activities, clubs, events, fun, good time, so much to do, transition, you will never be bored on December 11, 2011 by Altagracia Montilla.